Dusk Till Dawn Events are thrilled to bring you a terrifying night of all things ghostly in one of England’s most haunted Villages! Join us for an evening of village tales and legends with our Medium, for a ghost walk in the heart of the quaint, yet very historical and most haunted village of Pluckley in Kent. In 1989 Pluckley was officially named by the Guinness World Records as being the most haunted village in England, the village is famous for its many ghostly residents, strange occurrences and sightings. Found in the heart of the Kent Countryside, this village is also famous for being the setting for the filming of the Darling Buds of May that was a tv series in the early 90’s. Many ghost hunters have investigated this intriguing yet eerie area on the search for the entities that are said to remain such as the screaming man, the highway man, the Schoolmaster and the Red Lady to name such a few. 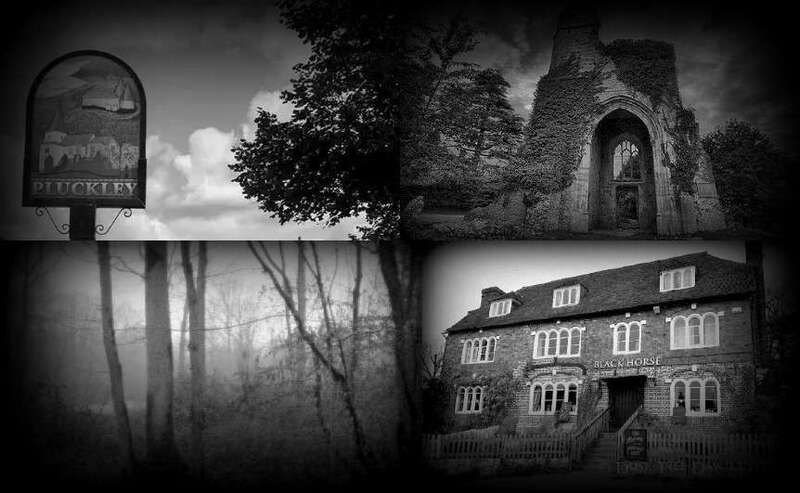 Take part in this fascinating evening ghost walk where you will be guided around the most reputedly area's of Pluckley, stopping at various sites to hear about the hauntings along with the local legends of this reputedly haunted village. Join us if you dare! Please note: This event will include a drive-in convoy to travel to an additional location during the evening; you will require your own vehicle to travel on a short 5-minute drive approximately. All payments including deposits and payments in full are non-refundable and non-transferable regardless of any circumstances. When you make a booking with us it is entirely your responsibility to ensure that you are able to make the event date that you have booked, as Dusk Till Dawn Events cannot offer a refund or transfer your places onto another event date if you or any of your party are unable to attend. The reason for this is that all places are paid for in advance to our locations, which means we are still liable for these costs even if you cannot attend the event. Please Note: There are no sleeping facilities available. Important: If anyone arrives under the influence of alcohol or drugs and/or is suspected of bringing alcoholic drinks to the event, they will not be allowed to stay for the night and will be asked to leave the premises immediately. This event is regrettably not suitable for anyone with mobility issues. Bookings are made through Dusk Till Dawn Events only do not contact the Location. *Prices are subject to change without notice see our Terms and Conditions for more information. Please do not park in the Blackhorse pub car park as this car park maybe locked after a certain time. *Prices and dates are subject to change without notice see our Terms and Conditions for more information. As this is an all outdoor ghost walk event we advise our guests to wear sensible footwear along with warm waterproof clothing. Please provide your own torch.We regret this event is not suitable for anyone with mobility issues. In the event of bad weather this event will go ahead as planned but small changes maybe made to the route to protect the safety of the attendees. IMPORTANT: If anyone arrives under the influence of alcohol or drugs and/or is suspected of bringing alcoholic drinks to the event they will not be allowed to join the event and will be asked to leave immediately. 1. Locations that we visit may not be suitable for anyone with mobility issues. Please contact us on 0115 9722534 for any enquiries regarding any of the above before you book an event with us. 2. The minimum age for participants to a Dusk Till Dawn Event is 18 years old. Please note that as these public events are for attendees aged 18 years and over, adult language may be occasionally heard, should you be easily offended please do not book. 3. Due to restrictions at our locations and other factors that may cause risk, we ask that attendees to our events are in good health, heavily pregnant woman are not allowed to attend any of our events. 4. Dusk Till Dawn Events operates a strict zero tolerence on any unacceptable behaviour, alongside a strict no drinking & drugs policy. NO ALCOHOL OR DRUGS SHOULD BE TAKEN PRIOR TO ARRIVAL TO THE LOCATION OR WHILST DURING AN EVENT. Should any guest be suspected of arriving under the influence of alcohol or drugs and/or is suspected of bringing alcoholic drinks to the event, they will not be allowed to stay for the night and will be removed from the premises immediately regardless of any adverse weather conditions and or travel arrangements and no refunds will be given. Guests are asked to be respectful to all attendees during an event, including the Dusk Till Dawn Events staff members and are asked to behave appropriately at all times. Any unacceptable behaviour will not be tolerated and will be acted upon by removing the person(s) from the event regardless of any adverse weather conditions and or travel arrangements and no refunds will be given. 5. Dusk Till Dawn Events do not allow smoking indoors (including vapes) at any of our locations, candles or other potential fire hazards are not to be used during your stay. 6. There are no sleeping facilities at our locations unless as advertised on the Dusk Till Dawn Events website. 7. Unless you have booked for a private night with Dusk Till Dawn Events, all of our advertised events on this website are for public ghost hunts. For health and safety throughout the night you will stay with your allocated group and will not be allowed to wander around the building, apart from any allocated free time offered, subject to the rules of the venue. We advise that if you do not want to be a part of a public event then alternatively you may want to book a private night/location with us - to ensure that you have the entire venue for just your party alone. 8. All luggage, clothing, equipment, vehicles and effects belonging to you or your party are your own responsibility. Dusk Till Dawn Events will not be liable for any loss or damage to luggage, clothing, equipment, vehicles and effects belonging to the participants before, during and after the event however caused. 9. Although Dusk Till Dawn Events cannot foresee any problems, accidents/incidents do happen. We advise you to stay with your group during your visit to the location and all members of your team should preferably have their own third party public liability insurance as our insurers have indicated that our public liability policies may not cover your party during your visit to the location since it is outside our normal public access categories. You are staying at the location at your own risk; we accept no liability for any death, accident or injury to yourselves, however caused. 10. By Booking with Dusk Till Dawn Events you agree that all footage and pictures taken during the event by Dusk Till Dawn Events can be used by Dusk Till Dawn Events. 11. Dusk Till Dawn Events make no guarantees regarding paranormal activity at any of our events, therefore we are not responsible for any information or lack of during the event. No perceived predictions, opinions, information, advice or comments made by our guest psychics, mediums, clairvoyants, hosts or co-ordinators should be interpreted as factual or actual. 12. You agree that any and all services from Dusk Till Dawn Events are for entertainment purposes only. We make no guarantees thus Dusk Till Dawn Events are not liable for any information or occurences regarding the validity, truth, or likelihood of any and all information obtained from our Employees, Contractors, Psychics, Mediums, Clairvoyants, Co-ordinators or Hosts on any of our events including our ghost walks, whilst we aim to place the ghost stories as close to the locations in which they happened, distance, time and lack of information pertaining to the origin location may restrict us from doing so. Information for our ghost walks are sourced from different sources such as local residents, hearsay, urban legends, books and the internet. Every attempt is made to verify and locate each story, however Dusk Till Dawn Events and Staff hold no liability over the validity of information provided in our ghost walks. 13. You, the member, guest, are responsible for making your own decisions and it is understood that when our Co-ordinators, Psychics, Mediums, Clairvoyants or Hosts suggest something to you, it is of their opinion and should NOT be interpreted as the only course of action. 14. We welcome your feedback on all of our events. If you have a problem or complaint during the event/day please bring it to the attention to a member of the Dusk Till Dawn Events staff as soon as possible so that they have a chance to put matters right. If your problem is not resolved during the event/day please contact us, including your order number, party name the event was booked under and the venue details. We consider it unreasonable if you take no action during the actual event/day or do not contact us within an acceptable time of 48 hours after the event has taken place. 15. Any event due to take place wholly or partially in the open air is likely to be affected by unsuitable/adverse weather conditions. In this case, Dusk Till Dawn Events reserve the right to relocate the event to an area undercover. In most cases all events take place, and it is your responsibility to bring suitable clothing to match the weather conditions for the time of year for ANY event booked whether undercover OR in the open air. In the case of poor weather conditions, Dusk Till Dawn Events will always work towards the event going ahead, it is very rare that any event is cancelled due to weather conditions and as long as our Hosts and Mediums are able to travel to our locations then all events would still go ahead as scheduled. Should the need arise however for an event to be cancelled because of adverse weather conditions, then all customers would be notified. Please note Dusk Till Dawn Events are not responsible for adverse weather conditions, neither are Dusk Till Dawn Events responsible if you, yourself choose not to attend an event due to poor weather conditions or other outside factors. Should an event still go ahead as scheduled then no refunds or transfers onto other events/dates will be given if any person(s) makes the decision themselves, that they will not be attending an event due to poor weather conditions or other outside factors. Dusk Till Dawn Events are not responsible for any guests travel arrangements as a result of adverse weather conditions. 16. Dusk Till Dawn Events suggest you either secure accommodation following the event or book transport home due to possible tiredness caused by the event, however Dusk Till Dawn Events do not have any liability to you and will not be liable for any expenses you may incur such as accommodation bookings and travel costs. We do not accept any responsibility for any accidents or incidents caused before, during or after the event. 17. Please note that all stories about the location are not fabricated. The Dusk Till Dawn Events Team have on occasion witnessed and recorded paranormal activity in various locations. 18. Dusk Till Dawn Events cannot guarantee that any paranormal activity will take place on the night of the event, as advertised per listing all events may or may not include a guest medium(s) or any history tour of the building. Please note if you are wishing to book an event solely based on a medium being present, then please call our office (prior to making a booking) on 0115 9722534 for us to confirm if a medium maybe present or not. 19. Dusk Till Dawn Events are sure you will have a good time, be respectful to the spirit world and to others involved in the event, be open minded in your approach, being openly cynical will spoil and tarnish the event for everyone, soak up the atmosphere and try to communicate with spirit! You never know what to expect, as every event is unique. 20. Cameras and recording devices are welcomed and can be used, during any of our events, however this can sometimes be limited depending on some locations own set rules. Any footage, whether sound or visual captured is for the sole use of the owner and is not to be used in the public domain or any social media platforms. Any images/recordings, whether sound or visual captured, belong solely to Dusk Till Dawn Events. Please note all other attendees must be asked of their consent before any recordings whether visual or sound are commenced. It is a must that permission is sought by Dusk Till Dawn Events before any captured footage, whether sound or visual is added to any social media platforms and or public domains. Please contact the Dusk Till Dawn Events office via email to seek permission. 21. All prices are subject to change without notice. Dusk Till Dawn Events also reserve the right to change to a different/suitable location prior to the event taking place, should any need arise and also reserve the right to promote events/products via different sources. From time to time prices on these offers may vary from the original price. Promotional or sale offers will not be given/offered or honoured to customers who have already paid or purchased before or after these offers, sales or promotions expire. 22. All bookings made through Dusk Till Dawn Events means you and your party’s acceptance of these Terms and Conditions. By accepting and agreeing with these Terms and Conditions you and your party are further indemnifying the promoters/organisers/individuals from and against all legal liability in respect of any claims, damages, costs, penalties, actions, demands, proceedings, any kind of legal suits, losses or expenses amounted in respect of or arising out of the injury to or the death of any person, or persons, or damage to any property arising from the client's participation and involvement in the event or activity or premises pertaining to the event. Discount codes/sale prices/offers apply to new deposit bookings and full priced events (for one night ghost hunts & ghost supers only). Discounts can be accepted via the online bookings proceedure via the Dusk Till Dawn Events website only. Discount codes/sale prices/offers do not apply to any final balance payments and or gift certificate purchases. Discount codes/sale prices/offers must be applied at the checkout at the time of booking - should the discount code/sale price/offer not be applied at the time of purchase the offer/discount/sale price cannot be given after the order has been purchased. Dusk Till Dawn Events reserves the right to advertise any promotional discount codes and offers via other social media sites such as Facebook and Twitter pages only. Gift certificates are valid for a full year from the time of purchase only - Please keep in a secure place for use as misplaced Gift Certificates cannot be re issued. If the purchased Gift Certificate is not used within the valid from and valid to dates as shown on the purchased Gift Certificate we will be unable to offer any exchanges or extended dates. All Gift Certificates are non-refundable and change will not be given if the amount of the Gift Certificate is not fully used. Gift Certificates can only be used redeemed via the Dusk Till Dawn website. Dusk Till Dawn Events reserve the right to cancel an event at any time for any reason at our own discretion particularly in the instance of an event not reaching its full selling capacity. Should we have to cancel, we will contact you as soon as is possible and will either offer you a full refund of any money paid by you - or move you’re booking (one time only) to another available date/event of your choice (please note if there is an additional price difference between events - any additional cost must be paid for). Dusk Till Dawn Events do not have any liability to you and will not be liable for any expenses you may incur such as accommodation bookings and travel costs. All payments including deposits and payments in full are non-refundable and non-transferable regardless of any circumstances. When you make a booking with us it is entirely your responsibility to ensure that you are able to make the event date that you have booked, as Dusk Till Dawn Events cannot offer a refund or transfer your places onto another event date if you or any of your party are unable to attend regardless of any circumstances. The reason for this is that all places are paid for in advance to our locations, which means we are still liable for these costs even if you cannot attend the event regardless. All deposit payments are non refundable - if this option is chosen a deposit will secure your place(s) on the event - however the final balance payment must be made no later than 4 weeks prior to the event as shown on the advetised event details listed. If the balance payment is not received by the due date requested - Dusk Till Dawn Events reserve the right to add your places back onto the website for general sale and retain any deposit payment already received. Unfortunately we cannot put your places back up for sale on our website for you if you are unable to attend your event. However, if the ticket price has been paid in full your tickets can be transferred to another third party of your choice. You can also advertise your tickets for sale on the Dusk Till Dawn Events Official Facebook fan Page, however advertising on this page must be made by the person that made the original booking only, OR by prior agreement with Dusk Till Dawn Events should you wish someone else to advertise your places on your behalf on our Facebook page. Please note however, these tickets are not to be sold on any other advertising site due to the contents of these terms. Please note: Dusk Till Dawn Events accept no liability for any third party transactions made via this method nor will Dusk Till Dawn Events enter into any correspondence to help with this transaction. All third parties need to be made familiar with Dusk Till Dawn Events Terms and Conditions. It will be automatically recognised that the person(s) purchasing your tickets from you will have been asked by yourself to read and will have agreed to Dusk Till Dawn Events Terms and Conditions. Failure to do so will result in the new attendee not being allowed access to the event/date. Throughout the event you and your party will act in a sensible manner and will not cause harm or injury to anyone else, any animal, or effect of property etc. Aggressive, rude, intimidating, threatening, unruly and unreasonable behaviour towards any member of the Dusk Till Dawn Events Staff, Person(s) and or Guests attending any event will not be tolerated or allowed. Any Guest(s) Persons(s) displaying any behaviour that is deemed unacceptable will immediately be removed from the event, this will be regardless of any adverse weather conditions and or travel arrangements and no refunds will be given. These Terms and Conditions are subject to change and Dusk Till Dawn Events reserves the right to amend these at any time without notice.